In 2012 DanceSport Victoria introduced a Regional Victoria DanceSport Development Program. This program consists of financial assistance, in the form of a grant, to any Victorian Regional resident registered with DanceSport Australia. Priority will be given to competitors in the Youth, Junior and Juvenile age divisions, however competitors in all age groups may apply. 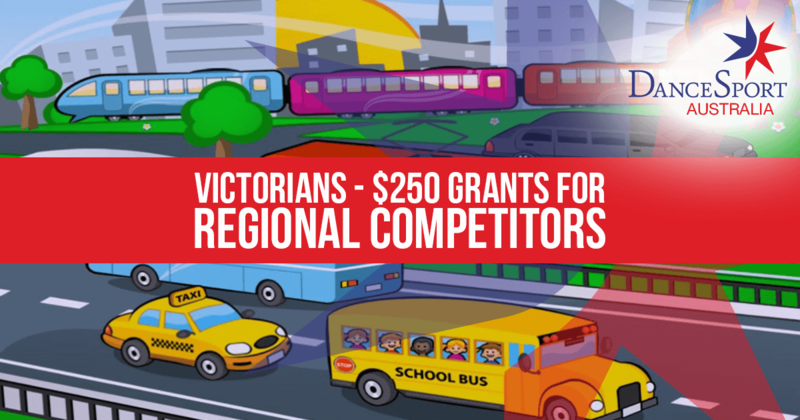 This grant may be allocated by DanceSport Victoria to individuals who live in Regional Victorian areas to provide some assistance with travel and coaching costs incurred in travelling to and from the Melbourne metropolitan areas with the purpose of competing in DSA registered events. The budget for the program is $3,000, to be divided by the total number of successful applicants, up to a maximum payment of $250 per application. Entry ticket costs to registered competitions. Applicants will need to provide the completed application form, copies of receipts or invoices in order to be reimbursed. It is expected that all claims will normally be finalised by 1 February for the previous calendar year of 1 January to 31 December (however for the 2017 year the cut-off date for applications is 28 February, 2018). To manage this program, DanceSport Victoria has appointed a project team that will assess applications and decide upon who is to receive grants. Their decisions will be final. The project team will decide within three weeks of the closing date. All applicants will be informed of the result of their applications by email.